The estate tax is sometimes referred to by politicians as the Death Tax or the Inheritance Tax. The words Death Tax and Inheritance Tax are not found anywhere in the law. The proper terminology is the Estate Tax. Politicians use the words Death Tax and Inheritance Tax because it hits a chord with people, even from those who will never pay a cent in estate tax. Only a very small percentage of people will ever be subject to the estate tax. For the very wealthy, the estate tax can be significant, but it does not have to be that way. There are many opportunities to substantially reduce the ultimate estate tax bill, and in some cases eliminate the estate tax completely. The only way, however, is to put the emotions off to the side and approach the problem like any other business problem; by having a logical, intelligent, and nuanced discussion with people who know what they are doing. Please see our Why Work with Us and Bio pages. There is no “silver bullet” that can simultaneously reduce your estate tax liability to nothing, while at the same time provide everything to your family immediately following your death. However, there are important steps that can be taken to reduce the estate tax liability without unreasonably infringing on your access to assets during your lifetime, or the ability of your family to inherit the substantial portion of your estate. Through a variety of steps, some large and some small, some to be taken immediately and some over time, we can help substantially reduce your estate tax liability. With proper estate planning, you get to choose two of them. Most people, given the choice, prefer to eliminate the IRS. The problem is that many people are never offered the choice. Consequently, the IRS becomes a primary beneficiary of the estate. We are offering you the choice! Die with fewer assets using gifting and other wealth shifting techniques. Structure ownership so that the remaining assets are valued at a discount when you die. Leave assets to charity either outright or using available planned giving strategies. Arrange for a life insurance company to pay the tax for you with funds that are not themselves subject to estate tax. Most estate planning solutions fall into one or more of the above categories. Instead of voluntarily offering your assets to the IRS, you can choose to implement one or more of the many estate tax planning techniques that will put more money in the pockets of the people and charities you care about. Our job is to explain these estate planning strategies in a way you can understand. It would be easy to do estate planning if you knew when you are going to die, but you don’t. Many of the best estate planning techniques gradually move assets out of the estate over a period of years. It is costing your family money for every day that you delay. You are losing the opportunity to move assets to the non-taxable side of the ledger. We have been involved in a number of sad situations where people did not move fast enough to reduce the estate tax bite and ran out of time. There is yet another reason to get moving on your estate planning now. As you age, your ability to grasp concepts will diminish. The time to make estate planning decisions is when you are at your sharpest, which is now. You will never be sharper than you are today. There is so much money on the table and it is just there for your taking. If you don’t claim it for your family, the government will claim it. You can make more money tackling your estate planning than you can by trying to make more money. Nothing you can do will yield greater results with so little effort. Contemplate this…What will happen to your home? What will happen to your investments? What will happen to your business? What will happen to your commercial real estate holdings? What will happen to your farm or ranch? We can tell you… assets are likely to be sold to pay estate tax. Is that what you want? Responsible Wealth means taking estate planning very seriously and doing the best you can for your family and favorite charities. Your family is relying on you. It is likely difficult for them to talk to you about it. You only die once and therefore you have only one shot at getting your estate tax planning right. If you get your estate planning situation squared away, you will relish in the satisfaction that your life’s financial accomplishments will live on. When your estate is settled, it will be obvious to everyone just how much you loved them. Do not blow it! You did not come this far to be careless at the finish line. There are three distinct asset buckets to the S2 Model. You can start wherever you want because each segment is dependent on the other. Our approach would typically begin with the Financial Nut. 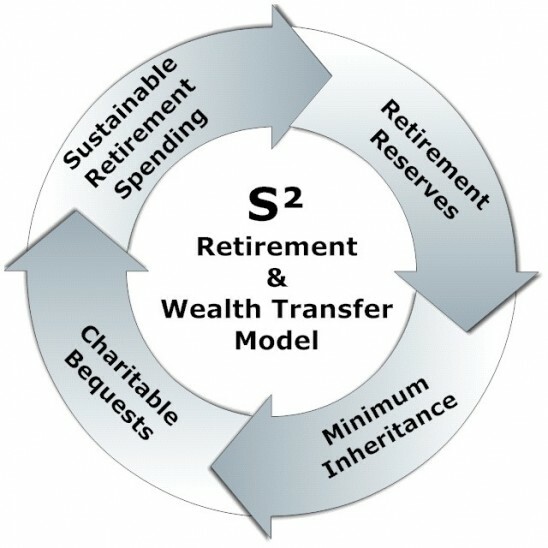 Using realistic assumptions about life expectancy, a conservative rate of return, and informed assumptions about taxes, we compute how much of your net worth will be required to fund your Financial Nut. For example, let’s assume a married couple, both age 70, with an $8,000,000 net worth. We might compute how much is required to cover after tax living expenses of $150,000/yr, adjusted for inflation, to age 100, using a 3% rate of return, and a 33% tax bracket. The next thing would be for you to decide on a Minimum Inheritance and purchase life insurance in that amount. The last thing to compute is the Financial Backstop. We would still use conservative returns, but maybe not as conservative as the 3% return and 33% tax rate we used to compute the Financial Nut. We might use an Equity investment with an 80-100% turnover rate, a 2% dividend rate, a 3% growth rate, and a 17% tax rate. We input the insurance premium payments into the model and determine on a year by year basis the amount available as the Financial Backstop. If the Financial Backstop amount is insufficient, we reduce the insurance amount until the Financial Backstop amount is sufficient. If the Financial Backstop amount is more than required, we increase the amount of insurance. In the end, the children will receive the Minimum Inheritance through the insurance, plus whatever other assets are left over after all taxes, including estate tax. All the taxes, including estate tax, are factored into the model but are not addressed as a separate goal. The likelihood is that the children will receive more that the Minimum Inheritance provided by the insurance. You may not need the entire amount set aside to cover your Financial Nut, or the entire amount set aside as the Financial Backstop, and/or achieve higher investment returns than the conservative assumptions used in the model. NOW JUST GO LIVE YOUR LIFE! YOU ARE TAKEN CARE OF AND SO IS YOUR FAMILY! There is always time, until there is no more time.